Subscribing to a podcast feed shouldn’t be a problem using the Podcast app on Windows Phone 8.1 or Windows 10 Mobile. Generally, all you have to do is search for the podcast name in the Podcast app search bar and – BAM – the podcast shows up for you in the results to click & subscribe to. But what the podcast doesn’t show up? This can happen if the podcast hasn’t been indexed by the search engine yet. If this is the case, the search field won’t find it and you won’t see it in the results. And if the podcast is new, it can take up to a week or more to show. Can’t you just type in the RSS feed address if you know it? Unfortunately (and annoyingly) the answer is no, not from the search bar. 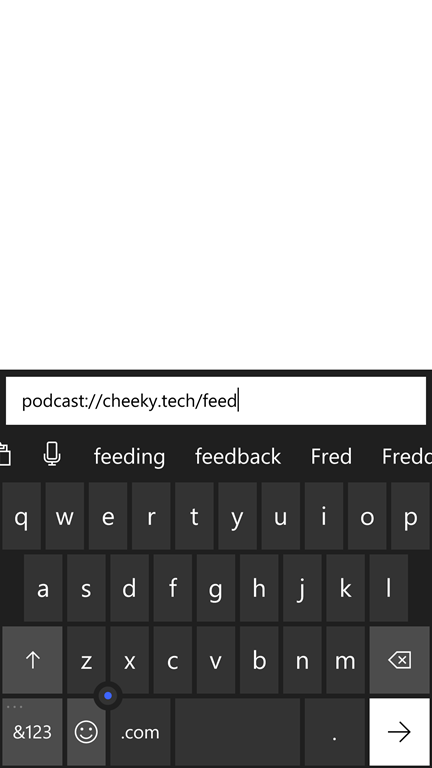 See, the search Podcast app search bar is actually “Bing” and when you search for a podcast through it, the podcast app is very strict about the results that it returns. Typing in the .RSS URL like http://feed.podcastname.com/rss isn’t accepted. Doing this will send the feed URL to the Podcast app which will enable you to subscribe to the podcast without searching for it.